No suitable hall could be hired for the match. May 30, 1873 will be the new date. Major McLaughlin and "other wrestlers with national reputations" are advertised. Also feautred boxing for a silver cup with: "Mike" Coburn, Arthur Chambers, John Murphy, Geo. Rooke, Geo. Seddons, Tim Collins, Pete Croker, Steve Taylor and others. Copeland is listed as the Champion of Canada. It's said McMahon is recognized as the World Champion following this contest. McMahon is listed as the American Collar & Elbow Champion. Ellis is listed as the English Devonshire & Cornwall middleweight Champion. The two men called it a draw after a hard battle. The Lewis County Democrat [Lane's home county] states Lane is the champion. However, it acknowledges McMahon retained the title in the results. The Ogdensburg Journal calls Lane, "Samuel." The Newark Union, New York newspaper states Mitchell's name as "David S. Mitchell." Some papers list this as McMahon winning the above mentioned championship. McMahon is listed as the American Champion. Ellis is listed as the English Champion. Lane is listed as the former American Champion. Ellis replaced his umpire Browning with Doyle after he was threw the first time. 1 - "Athletes of America"
As well as the wrestling match: "John McMahon and Homer Lane appeared in a sketch, during which Miss Marion Requa costumed like a Goddess of Liberty, and holding the national flag, sang songs and delivered some rhymes in a not very satisfactory manner. McMahon and Lane gave exhibitions of the gladitorial contests of ancient Greece." Full list of entertainers: "Ned Buntine, his pony Juno, a troupe of Iroquis Indians, and Scott the Scout, who will perform in a drama called 'Life on the Plains;' James Collins and Martha Wren, duettists; Prince Fritz, Dutch vocalist; Marion Requea, serio-comic; George Dunbar, Frank Donaldson, George H. Adams, W.E. Antonio, gymnasts; John McMahon and Homer Lane, athletes; Prof. Davis and his trained dogs; King Sarbro, gymnast; Delehanty and Hengler, song-and-dance; Eugene Blitz, with his Punch and Judy show; William Carter, banjoist; the Jee Children, hat spinners; Kitty Brooke, serio-comic; and J.W. McAndrews, Ethiopian comedian." Featuring John McMahon, the champion wrestler, with Homer Lane. Mike's brother Jack was also in attendance but had no wrestler to compete against so only Mike competed for the first prize with Titus. McMahon is listed as the "Champion wrestler." There was no wrestling during day one of this three day tournament. It started on Friday and was due to be continued on Saturday and Monday. Unfortunately during the fifth inning of the baseball game the rain came pouring down. The same happened on Monday. Lane is listed as the ex-American Champion. He was in town originally to visit his brother, Curtis G.
McMahon is listed as the World Champion. John McMahon, of Rutland, and Homer Lane are listed as late arrivals here. Attendance: "Scarcely a Foot of Available Space"
Was primarily a boxing event. Featuring: "Billy Edwards, Arthur Chambers, Mike Coburn,, Ned Mallahan, Warry Edwards, Jim Kelly, George Seddons, "The Mouse" and others equally well known; while the art of wrestling will be illustrated by John McMahon, Homer Lane, Matt. Grace and Doyle." McMahon is listed as champion wrestler. Also featured singing, dancing and club swinging. Also featuring: "Sam Collyer, Jem Murray in sparring, Miss. Katie Howard, serio comic, Billy Emmett, Ethiopian comedia; the Rogers Family, gymnasts; and Maggie and Harry Le Clair, duettists." Also featuring: "Miss Annie Morgan, vocalist; Cotton and Birdue, in songs-and-dances, Miss Maggie Walton, Miss Alice Ross, and Ed. Murray." Also featuring: "Ala, gymnast. Is shot up into the air a distance of 40 foot and catches the trapeze." Around June 21, 1875. Possibly for the whole of that week. Farrell is listed as the Pacific Coast Collar & Elbow Champion. Also listed as being champions are: Malry, Ontario (Canada) Collar & Elbow Champion; Fred Benchman, Michigan Collar & Elbow Champion; Albert Ellis, English Collar & Elbow Champion; and Copeland, Canada Collar & Elbow Champions. No mention is made of McMahon being the champion in the results. It is even said that he will now likely face Homer Lane, the "champion wrestler of the United States." McMahon said he would challenge anyone from the audience. Smith stepped up between the first and second fall. McMahon is listed as the United States Collar & Elbow Champion. Lane is said to have won 116 out of 118 matches. Featuring: "John McMahon and Homer Lane, wrestlers, and Augusta Chambers, actress. Kitty Henderson and George F. Moore continued." McMahon is listed as champion of the world. The falls for the second match were competed between the falls for the first. There was scheduled to be an additional collar & elbow match but there was no opponent for Caffrey. Also featured a variety troupe. This was the opening night of the theatre. Thompkins is listed as the Nevada Champion. 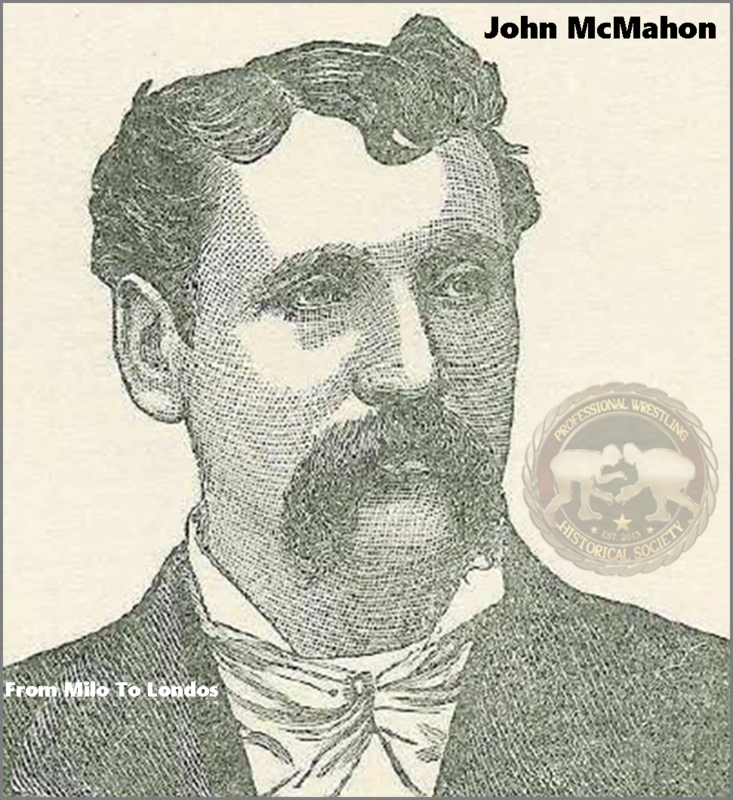 It was revealed after the fact that the Unknown Champion was in fact John McMahon (of New York), the American Champion, and he had been brought down by Cool Manly, a gambler who had recently lost money to Thompkins, in an attempt to regain his losses. McMahon is listed as the Californian Champion. At sixty-three minutes in the third fall McLaughlin threw McMahon and the referee awarded him the fall, he then changed his mind and declared it no fall. When the third fall was restarted it went to the curfew and the match was a draw. It is for the silver belt. McMahon is listed as the World Collar & Elbow Champion. The headline states it was collar and elbow but the article states catch-as-catch-can. Match called a draw at midnight, it started at 8:30. Miller is listed as the World Graeco-Roman Champion. McMahon disqualified for trying to take a hold below the waist in a combined Graeco-Roman encounter. The referee had to call the match a draw due to the lease of the hall expiring. Papers declare the match stopped 2:45, but no starting time is given. The length of the match comes from the Gannon-Schäfer files. The unknown was thought to have been John F. Kennedy (of Norwich, Conn.). Muldoon is listed as the Graeco-Roman Champion. McMahon is listed as the Collar & Elbow Champion. On Monday a coin was tossed to decide if jackets would be worn in the Catch-as-Catch-Can and Collar & Elbow bouts, McMahon won and the men wore jackets for those bouts. The match was thrown out before the third fall started due to a dispute over Muldoon's jacket. Johnson is listed as the World Middleweight Champion. "The belt, which will be on exhibition, is valued at $700. It is of silver, with gold front, on which is inscribed, 'Champion of America.' It was first got up about eight years ago, by subscription, to get McMahon and McLaughlin together; but, they not coming, Homer Lane won it; then Colonel McLaughlin; then Jim Owens, and then Johnny McMahon, the present holder." McMahon is listed as American Champion. Brien is listed as Western Champion. O'Brien is listed as the Southwest Champion. McMahon is also listed as the World Collar & Elbow Champion, but only the American version is up for grabs. O'Brien is listed as the Southwestern Champion. 208 people were turned away. The manager stated that all the information he had of the match he had seen in the paper. Appears the contest was never actually supposed to take place, the audience were said to be satisfied with the variety show put on though. J.W. Saxe a member of the audience fell dead at ringside during the bout due to "heart-disease brought on by excitement." It was announced around 2 hours into the match by McMahon's umpire that his mother had passed away recently and thus McMahon was very out of shape. The match was stopped and Dufur declared the winner with a rematch to take place at a later date. It's reported that John McMahon has announced he will retire at the end of the year. Featuring bozers: Dan Dyer, John Kelley and Edward Connor. The wrestling was to be performed by: John McMahon, Homer Lane and Paddy Crowley. "Before coming to Lowville Mr. Grant was associated with Homer Lane, at that time champion light weight wrestler of the United States, and John McMahon, the noted wrestler and sparrer. Mr. Grant bore equal honors with his associates in their athletic exhibitions." McMahon is listed as the World Colar & Elbow Heavyweight Champion. Crowly was a substitute for McMahon who was said to have a sore foot. The event was then cancelled when the owner of the venue, who had turned the lights out after an hour and thirty minutes of waiting for the wrestlers to show up, refused to turn the gas back on until he was paid the money he was owed. No-one volunteered the money and the wrestling was cancelled. This is event is the continuance of the tournament. Lane is listed as "ex-champion collaw-and elbow." McMahon is listed as "present champion." Also featued Matt Acton, Ike Sarsfield, John Pikey, Ted McGovern, Jack Hart, Corney Lee ("of England"), Billy Coupe, Young Hassel, John O'Grady, Benny Jones and Buck McKenna ("of Pennsylvania"). A boxing match took place too. McMahon & Lane are listed as the "Champion wrestlers." Also featured twenty new boxers and specialty artists. Ten wrestlers were featured in the tournament. Also featured boxing, cornet playing and Miss Woodward and Lizzie Kissner. As well as Kline and Murphy, Black Diamond and Black Star, Fred Wood and James McCarthy. It's noted Crowley is a wrestler, he stepped up to box with McCoy due to his original oppoent, Alf. Powers, refusing to fight due to small attendance. The wrestling was said to be the event with the most interest in it. Also featured: amateur running hop, step and jump, amateur running high jump, amateur standing jump, amateur one hundred yard dash, amateur individual prize drill, pro. five mile run, pro. three mile walk, pro. one quarter mile run, pro. one hundred yard dash, pro. throwing 40, pro. throwing 60lb, pro. throwing 66lb, pro. throwing 16lb, pro. standing jumps, pro. standing hip step and jump, pro. running high jump, boxing, and fencing. Who is the champion going in is not listed. Quinn is listed as the Pacific Coast Collar & Elbow Champion. It is reported that John McMahon has retired from wrestling. It's said that he, "Has been the collar and elbow wrestling champion of the world since his defeat of Mr. Owens in 1879." The article goes to say, "McMahon has wrestled 183 matches and says he will give $100 to any one who will prove that he was ever thrown in a match where money was placed by his friends." He is said to be 51 years old and a veteran of the civil war.